When planning an educational school trip for your class, it can be hard to decide where to go. Balancing fun with education is a challenge, no matter what age group you are planning a field trip for. With so many trip options available in southern Ontario there are many ways you can incorporate fun with curriculum-based outing. Picking our favourite school trip destinations is tough – and these are 5 favourites among educators and children alike. Do you agree? This museum of natural history, art and culture located in Toronto is the perfect destination for a school field trip. 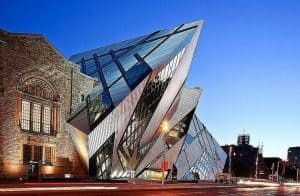 It is the largest and most visited museum in all of Canada, and one of the largest in North America. The ROM welcomes your students for guided tours, hands-on activities, and other programs that meet student needs and interest levels. With over 40 different galleries to choose from and over 6 million items on display, there is no limit to how you can align a visit with your Ontario curriculum requirements. Did you know that we take school aged children and adults alike to destinations throughout Ontario? Whether for your class trip, your athletic team or your seniors group shopping day out – contact us for a fast, free quote! Whether you are looking for a self-guided field trip experience or a curriculum-based guided program, Ripley’s Aquarium in Toronto is sure offer an unforgettable day. The only facility of its kind in Ontario, this aquarium will teach your students how to have a deeper appreciation for and understanding of life underwater and how important protection and conservation are. From classroom workshops to on-the-floor experiences and behind the scenes tours, Ripley’s Aquarium offers a range of sessions that align with Ontario’s Ministry of Education Curriculum. Take your students back in time with a visit to Black Creek Pioneer Village. The village set in 1867 offers 40 historic buildings, dozens of animals, several gardens and many unique education programs. Students will get an opportunity to see what life was like in the 1800’s through hands-on activities and curriculum-aligned programs facilitated by costumed guides. The Ontario Science Center offers over 30 different school programs designed to educate and engage your students. Here kids are encouraged to step outside of the classroom and experience the world of science and technology, and how it relates to every day life. From space exploration to geology, astrology to the science of music and even human anatomy, all can be explored and studied at the Ontario Science Center. A visit to the Art Gallery of Ontario is a great way to expose students to the world of art. Here they can develop an interest in the arts and improve skills like critical thinking, observation, interpretation and creativity. Each of their exhibitions is on display for your class to experience through self-guided visits or guided tours, along with an opportunity to combine those with an art-making workshop. Choose a destination and book your 2019 bus trip! Once you’ve chosen a destination for your school trip, lining up transportation is the next step. And the easiest! Contact us to choose the size of bus you need and we’ll get you there safely and on time! This lets you focus on the important stuff- like learning and having fun!